The Surfing Ecologist logo. Thanks to Jessica Maris for the kelp art, QUEST for the diver, and creative input from Allie Tissot. Are you as interested in the kelp as the swell in the lineup? Do you ponder what lives underwater as you wait for waves? Do you watch the jellyfish and stingrays zing by while surfing? If so, you might be a surfing ecologist and are doubly stoked hanging out in the ocean. Read on, this post is for you!! As I am hopelessly torn between my dedication to surfing and marine biology, I propose the concept of the Surfing Ecologist. At a recent conference sponsored by the European Association of Surfing Doctors I was inspired by Surfing Doctors passion and education to surfing and medicine. Together, these two fields create synergy and a focus on previously ignored or poorly understood areas of medicine relevant to surfers. This synergy results in better responses to drowning, increased knowledge about cold water tolerance, wound care, and clean water. They even have an annual conference and a journal. Surfing ecologists address the entire ocean realm: the waves, water, reef and associated ecosystem, with surfers in it. There is a similar and natural synergy between surfing and marine ecology and a group of like-minded individuals dedicated to exploring the interface between these two fields could produce valuable contributions to ocean health, conservation, and the well-being of surfers, marine life, and the coastal zone. Here I explore this concept, how it would work, and some ideas of what could be done. If you are interested in being involved just let me know in the comment section below or contact me at Brian.Tissot@Gmail.com. 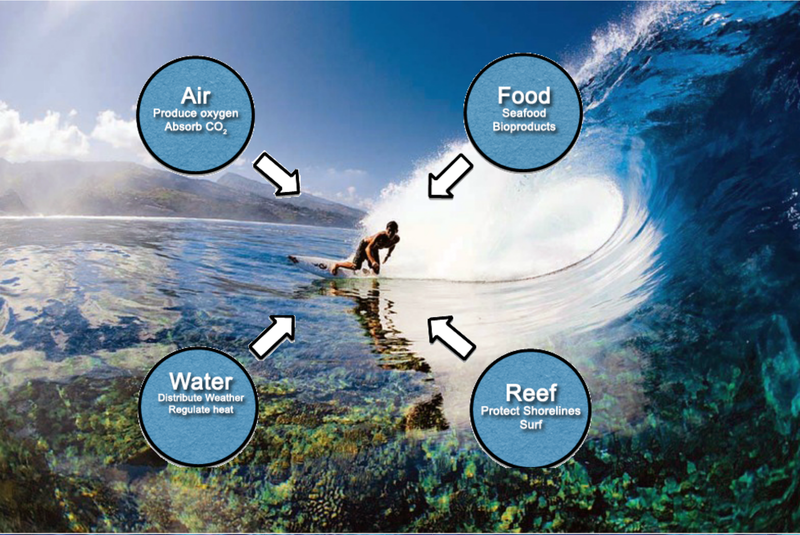 Surfing Ecology is focused on the idea of integrating surfing and ecology. In other words, how does a surfing lifestyle, one dedicated to riding ocean waves and frequenting a coastal environment, inform scientific research and education on marine ecological issues? How can we address scientific questions relevant to both interests and what would it look like? If you surf, care about the ocean, and have an interest in science, either as a professional or as an informed individual, then you are a surfing ecologist. So what are you gong to do about it? You may be contributing already and just don’t know it. My intention is to help clarify the possibilities and stimulate a focus on the synergy between fields. The possibilities are truly endless. 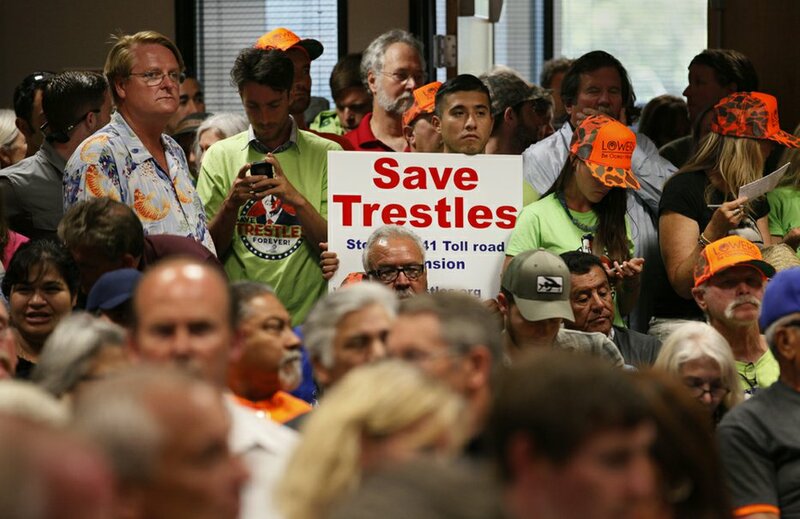 Surfers protest a coastal road planned through Trestles, California in 2013. The plan was defeated for the second time. Surfing inspires a dedication and passion towards the ocean that is unique among sports. Although many physical endeavors occur outdoors, surfing is entirely based on a product of nature: waves generated by wind. As such, dedicated surfers spend significant time in and near the water and are in tune with ocean’s tides, swells, and short- and long-term changes in the coastal zone. Because they spent much of their lives in the sea, they understand its patterns and rhythm and are engaged with other water folk. Moreover, there are an estimated 35 million surfers worldwide (Surf Careers) and many are engaged in coastal communities socially, economically and politically and thus represent an important and potentially influential group of individuals. They are a major agent of change and can be very persuasive. Moreover, surfers are a diverse group and their lifestyle makes them natural ambassadors for the ocean: people listen to us. As such we should be the first in line to protect the sea and our surf. 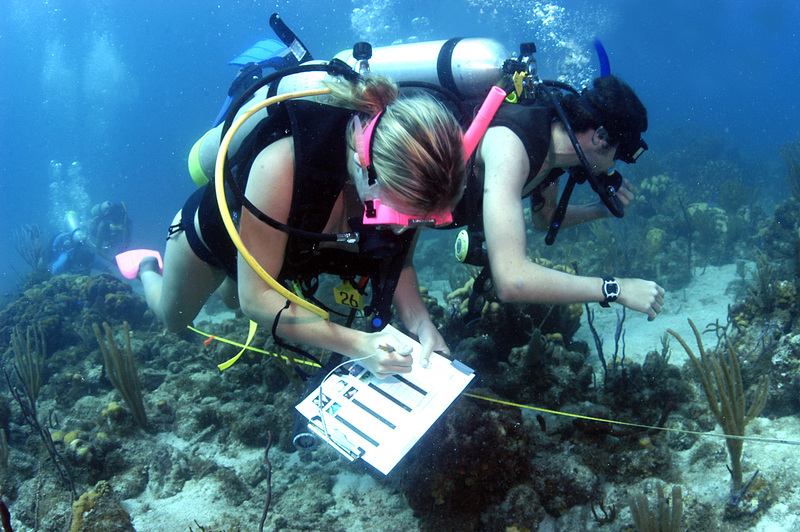 Marine biologist surveying coral reefs to assess reef health. Photo courtesy of http://educationcareerarticles.com/. 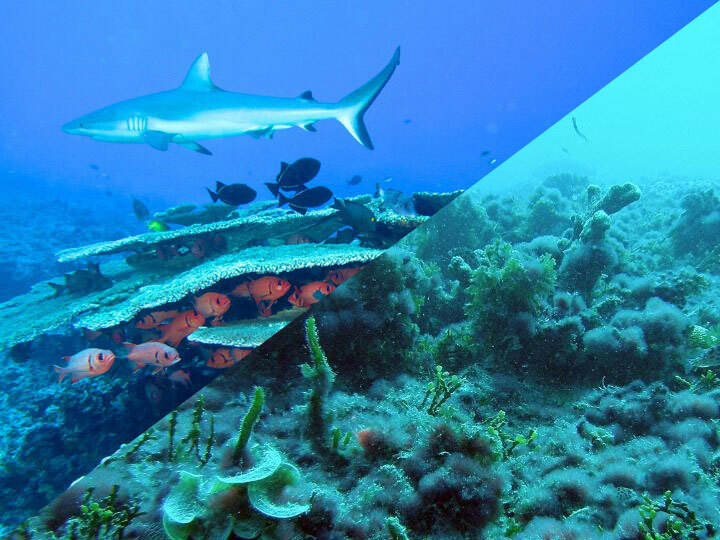 Marine ecology is the scientific study of interactions among organisms and their environment, including the biology, chemistry, geology and physics of the ocean. It is a broad field of study that is focused on understanding the oceans and marine life and developing solutions to problems influencing ocean health. Because marine ecology includes multiple diverse fields of study, including marine biology, oceanography, fisheries, and marine geology, it involves millions of scientists across the globe that regularly publish scientific research in journals, teach classes and give talks at universities, high schools, and other public settings, and develop policy and management plans at local, regional, national and international levels that protect and sustain our seas and marine life. In addition, there is a large and broad groundswell of educated individuals involved in scientific education and research at multiple levels. 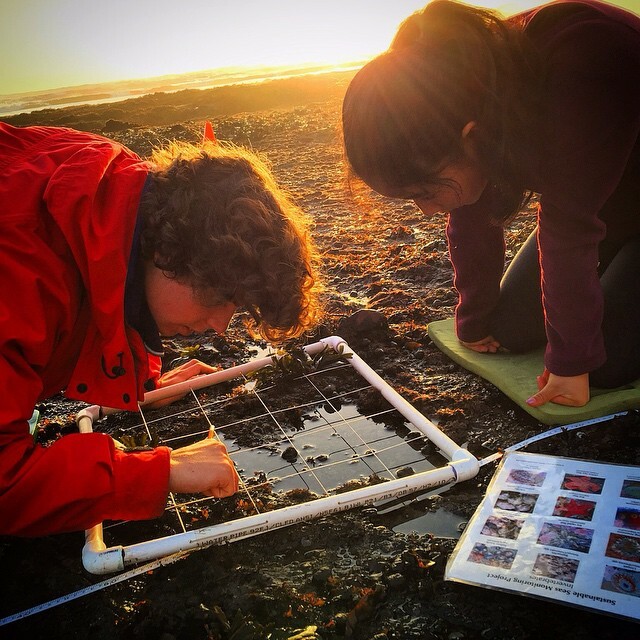 These endeavors, collectively called citizen science, are very effective approaches to conducting scientific research while engaging K-12 and college students as well as a broad coalition of the public. Examples of these programs include Reef, Reef Check and LiMPETS. 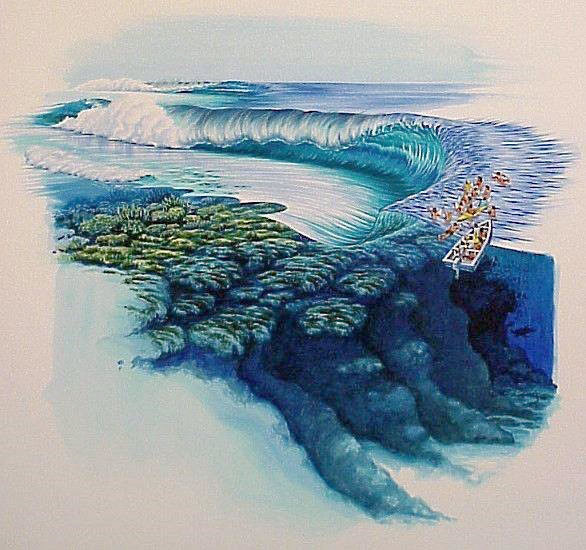 How surfing ecology might look. Hats off to Gary Larson. Together surfing and marine ecology can create significant synergy and help develop a focus on unique issues facing marine life, ocean health, marine conservation, and coastal issues. While some of the possible areas of overlap are not new to surfing nor marine ecology, the unity of these fields helps to identify new focal areas, key gaps in our knowledge, and a direction for future work. For example, the largest environmental surfing organization, Surfrider, is a large and highly effective global environmental organization with 84 chapters, including over 250,000 members in the U.S. Moreover, Surfrider is very effective in advocating for beach access, clean water, protecting beaches and surf spots from development, and promoting coastal and ocean health. However, there are additional issues important to surfers that are more relevant to marine ecologists. These include global climate change, habitat destruction, ecosystem studies, and fishery management, among others. As envisioned, surfing ecologists would support and extend Surfrider’s programs and policies as well as other surfing-oriented environmental groups, not compete with them. 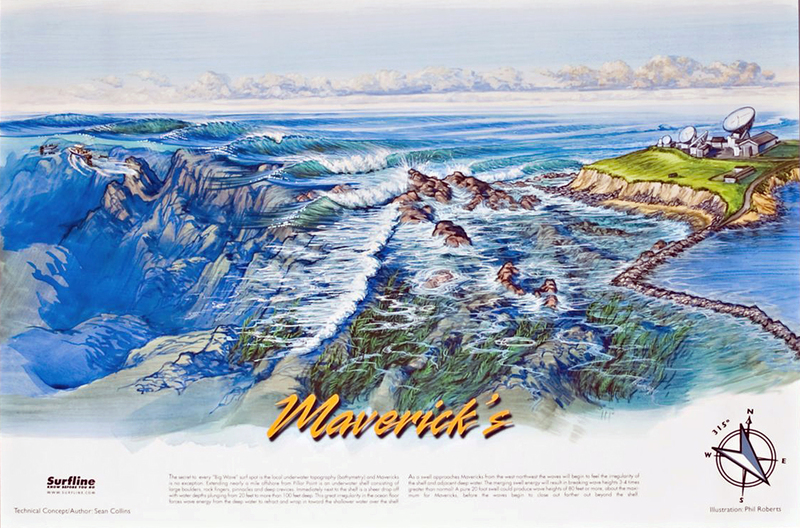 Physical and geological oceanography: Surfline in general, and Sean Collins in particular, were instrumental in developing wave forecasting models directed at surfers based on weather forecasts, ocean buoy reports, computer models, and a network of surfing observers. Collins was also instrumental in examining the geological structure of reefs and how they interacted with swell height, direction and period to predict times and places for good waves. Although the overall merits of providing these forecasting tools to surfers are debatable, they have increased the ability of surfers to seek and find good waves across the globe, more reliably schedule surf contests, and understand how ocean swell and direction affect local surf spots. However, despite these advances, these approaches fall short of utilizing the full range of potential in these focus areas, especially with regards to integrating marine life and living components of reefs into these topics. Surfline wave forecast based on computer models of weather and buoy data (left). Swell and reef analysis for Pipeline, Hawaii (right). Chemistry and biology: Surfrider and other groups, such as Heal the Bay in California, have been instrumental in addressing water quality issues in coastal waters throughout the world including chemical pollution, sewage discharges and biological contamination, and ocean dumping including trash and plastics. However, because these efforts are probation focused on protecting surfers, marine life also benefits but many challenges remain (see Ocean Conservation for Surfers). 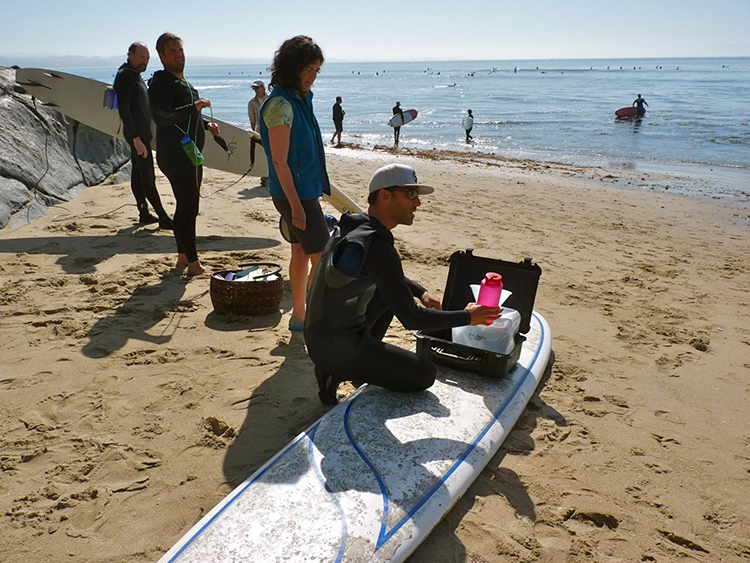 Surfers gather a water sample at Pleasure Point in Santa Cruz, California to measure radioactivity levels from Fukushima. Photos: Robin Brune. If there is enough interest, like the Surfing Doctors, we could create a formal association to enhance networking and schedule meetings, create a journal to publish relevant articles, and create a blog of interested posts. Of course it is easier to start simply by using social media: publishing articles, blog posts, tweets, pins, videos, and others using the hashtag #surfingecology and/or by including the logo above. If you want to work on this with me drop me a line at brian.tissot@gmail.com or let me know in the comment section below. Let’s do it! Here are a few examples that might be labeled as surfing ecology (many my own) but clearly there are many, many topics that could be addressed then this evening listed here. Please send me anything you find and I’ll list them here. Ocean Conservation for Surfers: Why Care about Healthy Oceans? An overview of marine conservation principles and applications for surfers. Shark Attacks and the Surfer’s Dilemma: Cull or Conserve? 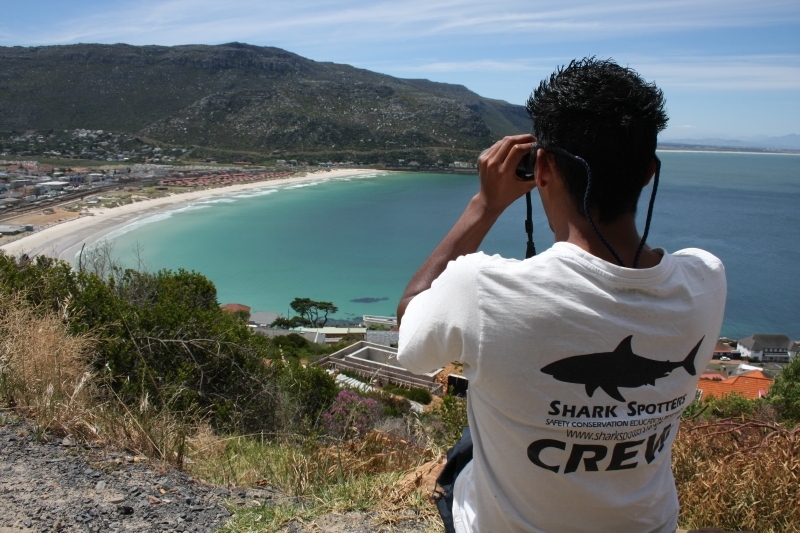 An evaluation of methods to control sharks focused on surfer’s concerns. Shark attacks are on the rise: five things you need to know. An overview of shark attack trends and data with a focus on surfers. Deep Impact: Five Reasons Why Surfers Should Care About Global Warming. Principle effects of global warming based on surfers perspectives. ← Ocean Conservation for Surfers: Why Care about Healthy Oceans? Hi! Really funny that I came across this. I am an ecologist and a surfer, and I am also in your photo from LiMPETS. Its a pretty obscure experience to come across your own photo on a website. I am happy its there though – we need to create a collaboration between surfers and marine/environmental science, especially in the board and wetsuit making process.